Over the past few years there has been intense debate between microfinance supporters and opponents on whether microcredit can lift people out of poverty. Many advocates have long painted a picture – often backed by individual success stories – in which households escape poverty once they receive a microloan. Women in particular are thought to benefit as access to credit allows them to become economically and socially more independent. More recently, however, doubts have emerged about the ability of microcredit to improve living standards in a structural way. What has been absent from this debate is solid evidence. To fill this gap, a number of research teams across the world started randomised evaluations (large field experiments) to rigorously measure the impact of access to microcredit on borrowers and their households. Studies were set up in Bosnia and Herzegovina, Ethiopia, India, Mexico, Mongolia, Morocco and the Philippines. Research took place in both urban and rural areas and evaluated both individual-liability and joint-liability (group) loans. Some of the participating microfinance institutions (MFIs) were for-profit organisations and others were nonprofits. Nominal annual interest rates varied between 12 per cent (Ethiopia) and 110 per cent (Mexico). 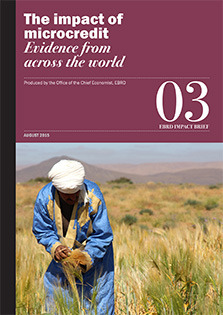 Together these studies have produced a rigorous body of evidence on the impact of microcredit in a wide variety of settings (see page 4 for further reading). They paint a remarkably consistent picture and contain four main lessons. Across all seven studies, microcredit did not lead to substantial increases in borrowers’ incomes. It did not help to lift poor households out of poverty. This holds when measured over both the short term (18 months) and the longer run (three to six years). A possible explanation for this is that while microcredit clients overwhelmingly reported using loans at least partially for business purposes, many of them also reported using part of their loans for consumption. Another possible explanation is that not all borrowers are natural entrepreneurs. Of those borrowers that used microcredit to open or expand a small business, some were more successful than others. 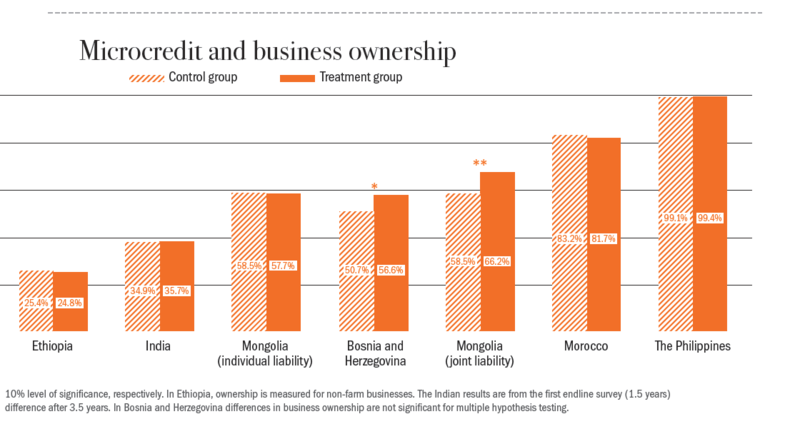 Though business investments and expenses increased for borrowers in several countries, researchers did not find any overall effect on borrowers’ profits in Bosnia and Herzegovina, Ethiopia, India, Mexico or Mongolia. If positive effects on profits were found, such as in Bosnia and Herzegovina, these were present among just a small segment of borrowers. Access to microcredit did not appear to have a tangible effect on borrowers’ wellbeing or the wellbeing of others in their households. For instance, three of four studies found no effect on female decision-making power and independence. In Mexico, where the MFI emphasised empowerment, women did enjoy a small but significant increase in decision-making power. In six studies, microcredit access did not lead to an increase in children’s school attendance. On the upside, the data collected by the research teams show that households with access to microcredit enjoyed greater freedom in deciding how they earned and spent money. In Bosnia and Herzegovina and Morocco, microcredit allowed people to change their mix of employment, reducing earnings from wage labour and increasing income from self-employment. In the Philippines it also helped households to insure themselves against income shocks and to manage risk. In Mexico, households with access to microcredit did not need to sell off assets when hit by an income shock. Importantly, there is no evidence of systematic harmful effects as a result of access to microcredit. For instance, overall stress levels among borrowers were no different from the comparison group in Bosnia and Herzegovina or the Philippines, though male borrowers experienced significantly higher levels of stress in the Philippines. Small changes to product design may have a big influence on how people use and benefit from microcredit. For instance, repayment for the typical microloan begins two weeks after loan disbursement and payment is usually required on an inflexible weekly basis. This can be an effective strategy to limit defaults, but may also limit borrowers’ income growth. In India, granting (some) borrowers a grace period – so that they can build a business before they need to start repaying – led to increased short-run business investment and long-run profits, but also increased default rates (Field et al., 2013). outcomes. MFIs and borrowers could also benefit from a better segmentation of the market, with MFIs offering larger, more flexible products to those clients most likely to perform well, and smaller, less flexible loans to less promising borrowers. Better ex ante differentiation is, however, not straightforward and would require better screening methodologies (Fafchamps and Woodruff, 2014). In addition, financial institutions could pilot better ways to help high-performing microentrepreneurs become eligible for SME lending. Today, successful and growing clients that need more funding may get stuck – too large for microfinance but unable to borrow from traditional lending institutions. MFIs could set up arrangements with local banks to transfer these successful clients (for a fee) to a bank so that they can continue their growth trajectory. Likewise, banks with both a microfinance and an SME department should ensure that fast-growing micro clients can easily graduate to SME status. Lastly, it has become increasingly clear that the rapid expansion of lender competition can tempt some clients to borrow from various lenders (double dipping), which may result in over-borrowing and repayment problems. A potential mechanism to prevent such problems is to let lenders share borrower information via a credit registry. 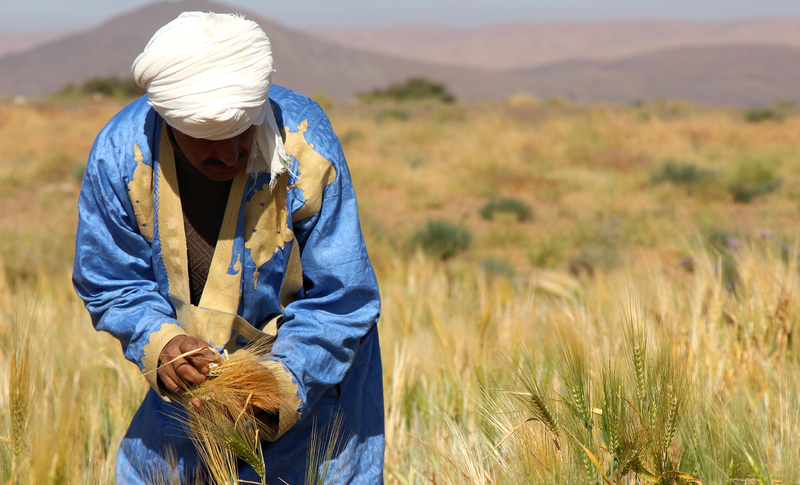 These considerations are particularly relevant for countries, such as Tunisia, that are currently opening up their microfinance sector to increased competition.